Toshiba has taken the wraps off a new hard drive recording technology it claims will dramatically increase the capacity of the 1.8in drives used in portable media players like Apple's newly announced iPod Classic. 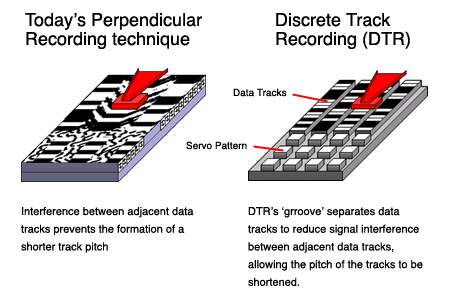 Dubbed Discrete Track Recording (DTR), the technique, as its name suggests, separates out parallel magnetic data-storing domains much like an old LP or a new CD does. Unlike today's perpendicular recording drives, this separation - Toshiba calls the gap between tracks the 'groove' - reduces signal interference between adjacent data tracks. That means the tracks can be made narrower, allowing more of them to be squeezed onto the disk. Toshiba said the data density could be increased by up to 50 per cent as a result. The technique is also applied to the extra information added to the disk to help guide the read/write head's servo motors more accurately. Toshiba said it had made a prototype drive that crams 120GB onto a single 1.8in platter - rather more than the 80GB-per-platter top-of-the-range 1.8in drives the company is currently offering - including, we believe, the 160GB hard drive found in the new iPod Classic. 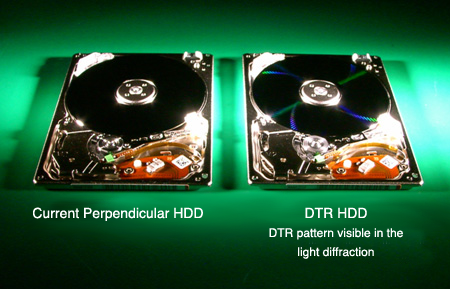 Toshiba said DTR is best suited to small drives, including 2.5in HDDs. So there's the prospect of a big increase in laptop hard drive capacities a little way down the line. How far? Toshiba reckons it will put DTR drives into mass-production in 2009, presumably 1.8in models first of all.